On April 27th, I set a new PB running a Half Marathon. I ran it in 1 hr 23 mins and 1 sec. Yeee- Freakin’ Haw!!! I went into this race, for the first time, with a very specific goal and detailed strategy. I went into this race, for the first time, with a totally different run form. I went into this race, for the first time, with a new mentor and new training style. I was probably more nervous then I had been in many races. I had come to the conclusion that I would hit my goal or drop out trying because there was no going back. Yes, I was nervous, but mentally I was determined and focussed. My goal was a 1 hr 25 min Half Marathon. Friday Night – instead of my usual pre race run, I was actually requested to do some drills with strides. My youngest daughter Keira spied me on the road and laughingly called to my middle daughter “ Alina, came quick! Daddy’s doing Irish dancing.” I finished up my drills and strides, and came in and stretched for about 15 minutes. Saturday Morning Pre Race – my usual cup of coffee, followed by my usual pre race breakfast. A bowl of cereal, a banana and a glass of juice. I gathered my things up, and left the house sipping on some sport drink as I drove to Cornwall. Once I got the urge to pee, I realised I had had enough and shut the sipping down. Arriving at the college in Cornwall, I quickly got my kit together and headed outside. I had to pee one more time. 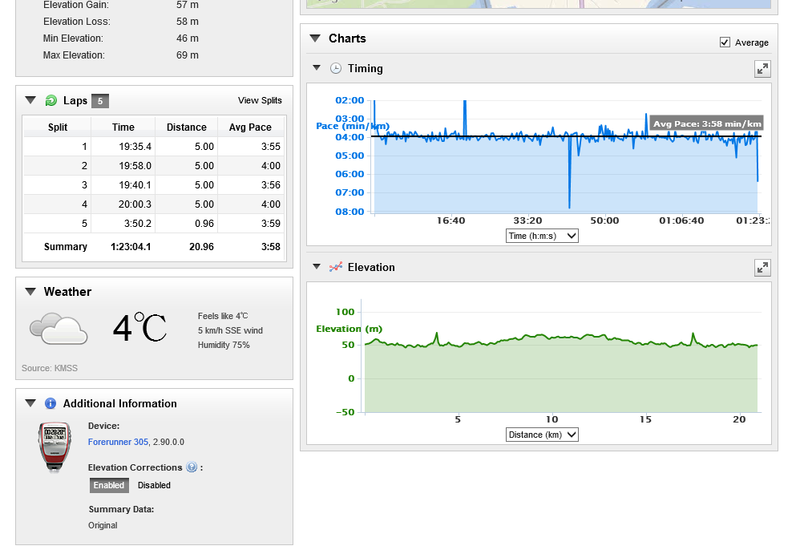 Pre race warm up – I opted to do some drills, with race pace picks ups as opposed to running the light 2K I normally do. Took 1 gel 20 minutes before race start. It was still about 4 degrees and overcast so great racing weather. We lined up and did our salute to Boston by pausing for thought. Then, I mentally eliminated everyone around me and became very focussed on what I was trying to do. I placed myself towards the front and decided to latch onto Chris Belair ( sound familiar? see Somerstown SnowShoe report ) for the first portion. I knew I was not going to be staying with him, but I wanted to follow his lead out and open a bit of a gap. I also was very aware Dan Contant was around and I was going to do everything I could to stay close to him. 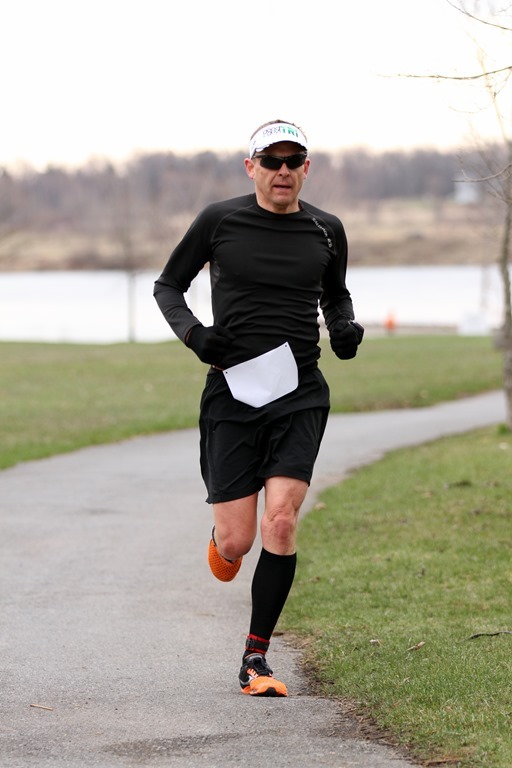 The first 2K – The plan was to go out a little faster, probably around 3:45 pace open up a bit of gap, then slow it back down to my target pace of about 4:00 – 4:02 min/km pace. I went out pretty much as described, except Chris pulled away much faster then I had thought. 12K – 16K – We were into some light rollers, and I sensed Dan had slowed slightly, so on one of the climbs I moved ahead to share the load. I had no trouble taking my turn as Dan was more then willing to let me stay on heels . We chatted as we ran along still jumping between a 3:50 and 4:00 min pace. At one point we were side by side, and I have to say, that running alongside Dan felt pretty awesome. He’s an amazing athlete and had this been mid summer…I can almost guarantee he would be ahead hands down. As we came upon the 16K mark, Dan started to pull away and opened up a gap of about 50 meters. 16K – 21.1K – I grabbed my last drink off a table, looked at my watch and realised I had a really good shot at breaking my original goal. What I was nervous about, was whether or not there was some monster hiding that would take me down. I decided not to try anything fancy, I was ahead of my goal and shifting to a different gear was not worth it. I continued on running the sub 4:00 min pace……and then we crashed into the 5Kers. It was a sea of people and I started dodging them left, right, center…on and on. I managed to keep a pretty consistent pace, but I did drop slightly. It was fine, I was still ahead and I was enjoying this last little bit of the run. Finish – I crossed the finish line feeling really good. I realised that it was without the usual finish line stress or post race exhaustion. I regained my composure quickly, grabbed a drink and shook hands with the guys who came in ahead of me. Much has changed for me in the last few months, and given I went into this race with so many unknowns, I am very happy with the results. My thanks to Mike Stashin of Run Effortlessly , Neil Rosenthal of Sole Fit and Good Guys Tri for their support over the last few months! Previous Article How do you define yourself?